Okay, I’m making a rule. Studios, you can no longer take old vintage films and give them a 3D transfer. We don’t want it, and we certainly don’t want to pay overpriced ticket prices to see it again. I doubt anyone will listen to me, but if we all say something, maybe they will stop this madness. Why do I say this? Well, it seems that James Bond, particularly the old Bond films will be re-released in theaters and blu-ray in 3D. Not happy about this. 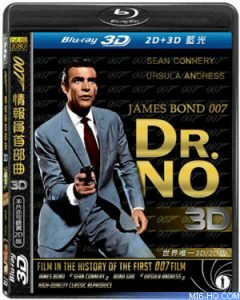 It looks like the Taiwanese blu-ray re-issue of ‘Dr. No‘, which is the first Bond film has a 3D version of the movie in the set. And the good folks over at Bleeding Cool discovered the Moviefone actually has a current listing on their website for an IMAX 3D release of ‘Dr. No‘. Certainly, as of now anyways, there are no confirmations on this 3D conversion or plans, but the writing is on the wall. Since ‘Skyfall‘ has made over $1 billion at the box office, and with the release of the recent ‘Bond 50 Years‘ blu-ray set, which has sold very well, it only seems fitting that the big bad movie company wants more of our money. And what better way than to make things in 3D. This 3D blu-ray definitely exists and is only a matter of time before it is released stateside. And then only a matter of time before it will be released in theaters for a week or two. And I guess each film will follow in suit if this proves successful. I’m not for this in any way. What are you thoughts? All 22 Bond Films Will Be Released on Bluray In One Big Mega Set!!! This entry was posted on Tuesday, February 19th, 2013 at 1:14 am	and is filed under Film, News. You can follow any responses to this entry through the RSS 2.0 feed. You can skip to the end and leave a response. Pinging is currently not allowed.